A new island has emerged off North Carolina's Cape Hatteras, with speed that has surprised observers and tourists alike. It appeared out of nowhere in April just off North Carolina's Outer Banks—a new land mass poking through the surf, a brand new Atlantic Ocean island. Along this dynamic stretch of sea, where the cold, southbound Labrador Current churns and crashes into warmer Gulf Stream waters, it is not unusual for patches of ground to emerge and then quickly subside. These are, after all, some of North America's roughest waters, a shallow region of swirling tides, hidden shoals, and harsh winds known to sailors as the Graveyard of the Atlantic. Shelly Island. Born Spring 2017. Yet even for this place, this new formation is of a scale rarely seen. The crescent-shaped spit is close to a mile long. At its widest point, this island reaches a football field or more across. "It's a hoss," says Danny Couch, 57, a local historian, tour guide and lifelong resident of nearby Hatteras Island. The appearance of this new island is drawing attention from coast to coast, though experts warn that it's surrounded by dangerous currents. Whale bones poke through its sands, along with the ribs of old shipwrecks. Beautiful seashells dot its beaches. The ripping seas separating it from the rest of Cape Hatteras National Seashore have brought in sand tiger sharks and "oceanic manta rays the size of car hoods," Couch says. "It's unusually large compared to what we've been seeing in recent decades," says Dave Hallac, superintendent of Cape Hatteras National Seashore and the Outer Banks Group. "But if you put this in geological perspective, it's nothing really." In fact, for people who understand the transitory nature of this place, what happens next seems almost preordained. This land mass could be gone with the next storm, or this island could get bigger for awhile longer—but probably only for a short time. Hallac, Couch, and several other experts agree: the new landmass some have taken to calling Shelly Island will almost certainly be wiped out within the year. "Nothing here becomes a fixture," says Stanley Riggs, a retired geology professor and author who has written books about North Carolina's coast. "Nothing is the same from one hour to the next. There's no such thing as 'normal.' "
Adds Couch, "Everything here can change overnight. That's what makes it so amazing." When people first started noticing the sandy ground rising through the water across the surf from Cape Point, authorities didn't pay much heed, says Mark Dowdle, deputy superintendent of Cape Hatteras. That's just the way things here work. "It's just part of the natural process," Dowdle says. 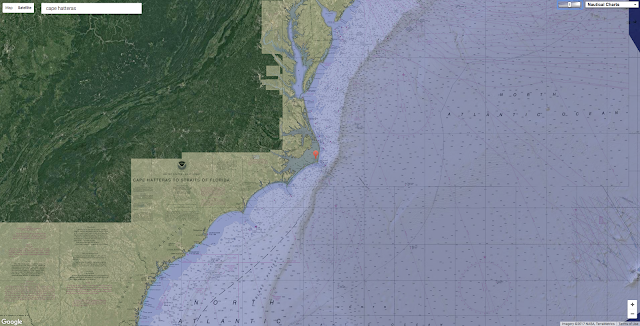 "I've seen parts of the Outer Banks erode for months, only to then fill back in again." In some areas, storms and rising seas tend to eat away at beaches. "You get lots of energy, lots of storms, lots of turmoil, lots of complex and dynamic currents," says Riggs. "The land to the north is skinny, skinny skinny, so skinny you can throw a baseball across it. To the south are some of the few beaches in North Carolina that're actually growing." All this ferocious change comes to a head near Cape Point, which is just 10 miles or so from the edge of the continental shelf and the place where the Labrador and Gulf Stream meet. As a result, there's never really any telling what sea here will do to land. 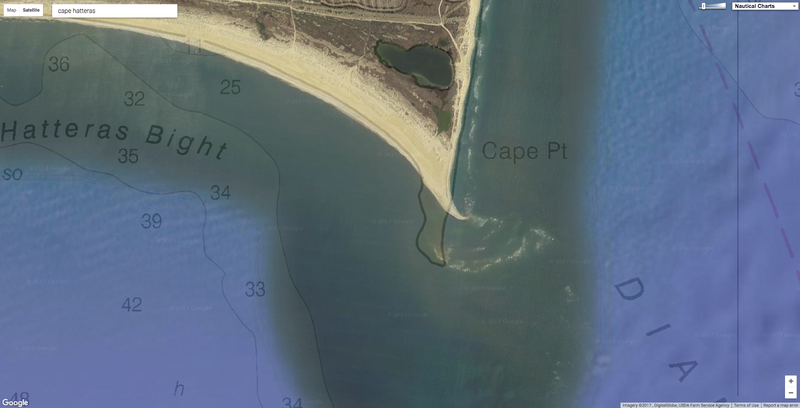 In the 1950s, for example, a Cape Point campground was separated from the water by little more than a sand dune. Today those some campsites are a good quarter mile from the sea. "There are times when we've had hurricanes or tropical storms where certain sections of the beach just start to disappear," says Superintendent Hallac. "In other sections, I'll see something sticking out of the sand and realize it was the top of a sign that had been standing at eye level." The only thing you can count on here is the beauty and surprise that comes with impermanence. "I suspect it will continue to change," Dowdle says. "It always has. It most likely always will."